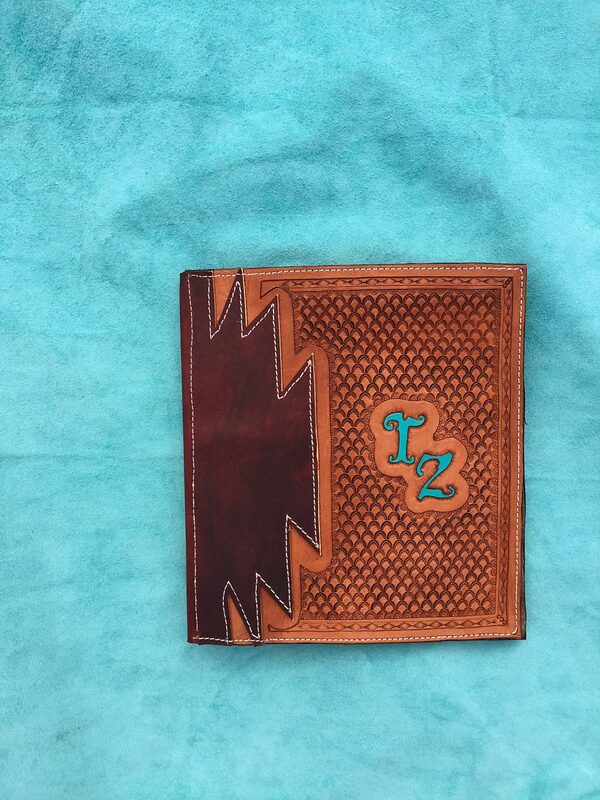 Leather bound calving books can be made in a variety of designs and colors. Scouting the internet for an easier way to keep track of her livestock records has jump-started Ashten Marchant’s leather crafting business. Her idea to make a leather-bound calving book has turned into a hot seller this holiday season, after she advertised one for sale on her Facebook page, A Bar Leatherwork. “Within hours, I had sold several, and ran out of books for the inside. Since then, the orders keep pouring in. It has definitely been a jump-start for my business,” said Marchant, who is from Newcastle, Wyo. The calving books take anywhere from 2½ to 4 hours per book to make, depending upon the difficulty of the brand. “Brands with basket stamping have by far been the most popular design for the calving books. I do most of the brands on the computer, but when I get something more difficult like a mill iron or a cotter key, it takes more time because it is hard to draw those on a computer,” she said. With her flair for design, Marchant has custom made all her own tack, with the exception of her saddle. “My favorite item is probably a tripping collar I made for my breakaway horse. I like feathers and headdresses and lots of color, so I made it with 75 colors. I spent a lot of time painting it. I wanted every color to match, and I didn’t want to use any color more than twice. It was a lot of work,” she said. Everything Marchant makes is custom, and developed from pictures and ideas she finds on social media sites like Pinterest and Facebook. Other ideas come from things she sees on the road while competing at rodeos. “Sometimes, I will see a picture on someone’s facebook page, and think to myself how it would look on a headstall or breast collar. I also make a lot of belts, and they are not just plain basket ones. I like to use crazy colors, feathers, Indian skulls and money signs,” she said. Marchant finds most of her supplies at a big leather show held each year in Sheridan, Wyo. “They have a lot of hides to select from, so I pick up several different colors and tooling hides. If you are going to do it as a profession, it takes a lot of leather, tools and patterns. Leatherwork is not a cheap hobby,” she said. Hoping to one day turn her talent into a lucrative business, Marchant said she learns a little more with each item she makes. “The first year I went to the show, I picked leather based solely on what I like. I learned that my taste may be a little more on the wild side compared to what some people like, so now I pick more neutral colors. I also try to buy a lot of leather in teal, because it is a very popular color,” she said.